Birthplace : Sun Praire, Wisconsin, U.S.
Georgia O'Keefe, also known as: Georgia Totto O'Keeffe, Mrs. Alfred Stieglitz, born November 15, 1887 in Sun Prairie, Wisconsin - died March 6, 1986 in Santa Fe, New Mexico was an American artist and also an illustrator for advertising firms. From her roots in rural Wisconsin, painter Georgia O'Keeffe rose within an art world dominated by what she called "the men" to become the best-known female artist in the United States. A reflection of O'Keeffe's strong, independent spirit, the label of "female artist" was one that she herself disagreed with throughout her life; defiant of both social and artistic conventions, she preferred to think of herself as, simply, an "Artist," producing works that could hold their own in comparison with those of her male colleagues. While classified by critics as everything from "surreal" to "precisionist" or "romantic," O'Keeffe's paintings were done in a deliberately original and independent style intended, the artist later said, to "satisfy no one but myself." Despite her continuous battles with critics who insistently tried to pigeonhole her work into one or another school of painting, O'Keeffe thrilled both art critics and art lovers and enjoyed huge amounts of praise, a reputation for quality, and top dollar for the paintings that she sold, even during her lifetime. "Somehow, what I painted happened to fit into the emotional life of my time," O'Keeffe once told New Yorker contributor Calvin Tompkins of her ability to connect with the public conscience of the nation. Indeed, O'Keeffe's lasting legacy has been a body of work that reflects the nature of Americans to look at the world around them in a fresh light. O'Keeffe was born November 15, 1887, in the rural community of Sun Prairie, Wisconsin. Because Wisconsin winters are so harsh, the young Georgia was kept inside, away from the bitter cold, for the first half year of her life. Blessed with an amazing memory, she recalled even as an adult the rush of excitement she experienced upon first being brought outside into the warm spring sunlight. The power of light to transform objects found its way into many of O'Keeffe's later works of art. One of seven children born to Francis O'Keeffe, a farmer of Irish descent, and his wife, Ida, a woman of aristocratic Eastern European heritage, Georgia was raised within a large extended family that included grandparents, aunts, and uncles. Despite the constant hubbub caused by friends and family that surrounded her during childhood, O'Keeffe tended towards being a loner; while she could be sociable and even fun to be with, she also often rejected the company of others, preferring to go to a quiet corner of the house or yard and read or draw. Ida O'Keeffe, although living the life of a farmer's wife--which revolved around practical, necessary matters like cooking, doing laundry and mending, and keeping house--wanted her children to benefit from the exposure to culture that she had acquired during her more affluent childhood. Reading aloud to her family everything from classic works of literature such as the Thousand and One Arabian Nights to imaginative tales from the Wild West, Ida also encouraged her daughters to take art lessons. An amateur artist herself, she sacrificed in order to send each of the O'Keeffe girls to an art tutor, despite the fact that the family's financial circumstances grew increasingly strained during Georgia's childhood. Left to her own devices, however, young Georgia's tendency was to draw totally from her imagination--palm trees and ocean coastlines and other exotic things that she had never actually seen around her home in the northern Midwest. At the age of thirteen, O'Keeffe attended Madison, Wisconsin's Sacred Heart Convent School, where her art education included drawing still-lifes, a task that forced the young artist to develop her powers of observation. For that is what O'Keeffe already was: an artist. Despite the limited opportunities available to women at the turn of the twentieth century, she knew she wanted more from life than the traditional--and expected--roles of wife and mother could offer. She had decided early on that she would become an artist; by age ten she had already confided her plans to a playmate. That decision having been made, O'Keeffe pursued it with single-minded determination for the rest of her life. When O'Keeffe and her family moved to Virginia in 1903, she kept up with her art studies, attending Chatham Episcopal Institute, a private school near Lynchburg. Because attending private school left her without the chance to meet other teens her own age, O'Keeffe remained a loner. In the milder, mid-Atlantic climate, she became interested in objects from nature and disappeared for hours, following trails winding through the Virginia countryside in solitary pursuit of wildflowers, rocks, and other subjects for her drawings. After graduating from Chatham in 1905, O'Keeffe moved to Chicago for a year in order to study at that city's Art Institute. There, under teachers like artist John Vanderpoel, she was taught the artistic traditions of the European masters, whose dark, static style was revered and copied by most artists of the period. There also she began drawing from live models and studying human anatomy. A hard-working pupil who followed the instructions of her teachers despite her personal dislike of the heavy European style, O'Keeffe became one of the top students at the Art Institute. A bout of typhoid fever prevented O'Keeffe from returning to Chicago the following year; instead she remained at home, though not without her drawing materials. In 1907 the twenty-year-old artist moved to New York City, attending classes at the famous Art Students League while modeling for other art classes to help pay her way. Her instructor here was William Merritt Chase, a respected artist who taught O'Keeffe to paint rapidly using quick, short brush strokes. Through constant practice--Chase demanded a new painting from his students every day--O'Keeffe mastered the traditional European portrait painting techniques being taught. She even won a top prize for a still-life composition at the Art Students League. But she remained frustrated that she had not yet discovered her true "calling" as an artist. "[A] lot of people had done this kind of thing before I came along," she later wrote in her self-titled autobiography, adding that "I didn't think I could do it any better." Another frustration that O'Keeffe was probably experiencing during this period was less an inner dissatisfaction with her own performance than an outer one. Because she was a woman she was not taken seriously as an artist, either by her teachers or her fellow students. Despite the fact that women made up more than half of the student body at the Art Students League, it was assumed that those who did not find husbands, marry, and begin to raise families immediately after graduation would become art teachers. Even with the natural talent and proficiency that kept O'Keeffe at the top of her class, she was never given any sort of personal guidance towards making her living as an exhibiting artist. Unfortunately, due to the O'Keeffe family's increasingly difficult financial circumstances--caused by her father's failed business dealings and her mother's long and ultimately fatal battle with tuberculosis--the free and easy life of a student would no longer be possible for Georgia. Forced to end her studies at the Art Students League, O'Keeffe moved her aunt's home to Chicago in 1908 and found work as a commercial illustrator, drawing lace and embroidery designs for advertising companies. She also designed the little Dutch girl, a logo that is still used on cans of Dutch Cleanser today. O'Keeffe worked in Chicago for the next two years, before leaving the Midwest altogether to teach art, first at Chatham Episcopal Institute, and then in the state of Texas. Continually frustrated by her perceived lack of progress and hating commercial art, O'Keeffe was all but ready to set aside her dreams of being a painter by 1910. Fortunately, it was while attending a class at the University of Virginia in the summer of 1912 that her desire to paint and draw was reawakened. Studying art with Alon Bement, a regular faculty member at Columbia University in New York City and a disciple of noted teacher Arthur Wesley Dow, O'Keeffe was struck with her instructor's overriding design tenet: "to fill space in a beautiful way." She realized that she didn't have to copy the traditional or current European painting styles that she had been taught. And she didn't have to continue to use her teachers' methods, except as she chose to. With a new sense of her own potential as a painter, O'Keeffe left New York to begin her new job as a high school art instructor in Amarillo, Texas. She filled her spare hours by painting the southwestern landscape she loved in a way completely her own. From 1912 to 1913 O'Keeffe continued to teach in Amarillo's public schools; her summers found her close to her family, teaching art to summer-school students at the University of Virginia. It was while teaching in Virginia during the summer of 1913 that a fellow instructor introduced her to the works of Russian artist Wassily Kandinsky. Kandinsky's colorful, abstract images caused O'Keeffe to look at her own art through different eyes. She realized again the importance of breaking away from the style of the European school. This meant unlearning much of what had been taught to her during her studies in Chicago. Inspired by Kandinsky's work, including his book, On the Spiritual in Art, O'Keeffe resolved to begin to use her art to express her personal, non- European vision; packing up her canvases and her belongings, she returned to New York City, where Bement had invited her to work as his graduate assistant. There, from 1914 to 1915, she enrolled in classes with Dow at Columbia University. Once again energized by the creative bustle of the city, O'Keeffe, like many other young avant-garde, or experimental, painters, began to frequent the 291 Gallery located on Fifth Avenue in downtown Manhattan. Co-founded by pioneering photographers Alfred Stieglitz and Edward Steichen in 1907, the gallery--with Stieglitz now at its helm-- had become a mecca for artists like the radical Dadaists, who used the gallery as a meeting place and a space for holding regular exhibitions of new works. In the fall of 1915, with money running low, O'Keeffe was forced to return to teaching. This time she worked at Columbia College, a small Methodist institution in Columbia, South Carolina. Again removed from the artistic mainstream of New York, O'Keeffe started to once again question her work as an artist. Recalling her reaction to the works of Kandinsky, she left painting with heavy oils and began to use simpler tools--charcoal and paper--as a way of more loosely shaping her inner feelings in a visual manner. The pictures that resulted were unlike anything that was being done; and the abstract direction her emotions appeared to be taking alarmed O'Keeffe, who feared she was losing her artistic ability. Once again, she started to think about stopping her painting altogether. During the long months she spent teaching down in South Carolina, O'Keeffe corresponded almost every week with Anita Pollitzer. Pollitzer, a former schoolmate at the Art Students League, an officer in the National Women's Party, and an ardent feminist, was the perfect person to keep O'Keeffe's confidence from crumbling. Through their letters, later published as Lovingly, Georgia: The Complete Correspondence of Georgia O'Keeffe and Anita Pollitzer, it was obvious that the relationship between the two students was a supportive one: depressed and often lonely due to her isolation from the energy of the New York City art world, O'Keeffe was able express her frustrations at her works-in-progress. Pollitzer, living in Manhattan during a period of great intellectual and artistic activity, could keep her friend informed of trends in the art world, sending books, art supplies, and news of cultural events she attended. At the beginning of 1916, O'Keeffe rolled up some of the abstract drawings she done in charcoal--work that she later described as a creative breakthrough, "essentially a woman's feeling"--and mailed them to her friend; Pollitzer was so impressed that, despite O'Keeffe's request not to show them to another soul, she took the drawings to Stieglitz. The gallery-owner was impressed with the work, which, as Pollitzer wrote to O'Keeffe, he described as "the purest, finest, sincerest things that have entered 291 in a long while." Holding a liberal feminist viewpoint compared to most of the other leaders of the art world, Stieglitz hung O'Keeffe's drawings in his next show. Without her knowledge, the twenty-nine-year-old schoolteacher became an overnight celebrity among Manhattan's avant-garde art community. Managing to appease the angry young artist, who had returned to New York City to enroll in a summer class at Columbia only to find her works on exhibit without her permission, the persuasive Stieglitz eventually convinced O'Keeffe to quit teaching and devote her full attention to artistic pursuits. With his financial support--and eventually as his mistress--she left her current job as head of the art department of West Texas State Normal College after only two years and returned to New York City. Joining Stieglitz in 1919 and warmly welcomed into the inner circle of New York- based artists and photographers, O'Keeffe gained increasing fame as, one after another, one-woman exhibits of her work were launched at his galleries 291, Intimate Gallery, and An American Place. Interested primarily in O'Keeffe as an accomplished artist producing work as good as that of any man, Stieglitz also found himself falling in love with this aloof, independent woman. Despite an age difference of twenty-three years, the two married on December 11, 1924. While Pollitzer continued to be instrumental in aiding O'Keeffe throughout her early career, the relationship between the two friends reached a sad impasse several decades later. In 1955 Pollitzer began to write, with O'Keeffe's approval, a biography of her artistic friend. But when it was completed, after two years of copious research, the uncompromising O'Keeffe refused to allow the book's publication. Her last letter to the stunned Pollitzer--"It is a very sentimental way you like to imagine me. It reads as if ... we didn't understand one another at all"--ended their friendship. 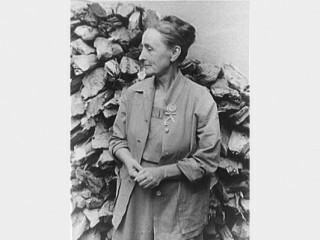 Despite the artist's objection, Pollitzer's biography, entitled A Woman on Paper: Georgia O'Keeffe, would eventually be published in 1990, fifteen years after its author's death. O'Keeffe's early, abstract works in charcoal astonished critics when they were first exhibited at 291 in the spring of 1916. In fact, because of their absolute originality when compared to her later work in oils, these drawings have caused some critics to think less of the many series of paintings that would follow. While O'Keeffe decided to abandon her abstract style in the early 1920s--a woman who disliked being disagreed with, she became increasingly irritated by the widely differing critical interpretations being attached to her drawings--many biographers have since claimed that O'Keeffe herself considered works like Evening Star III (1917) to be among her most accomplished. By abandoning this early, abstract style, it is felt, she left her artistic potential untapped. "Surely it is her early work, made when she was still influenced by the principles that imbued 291, by its insistence on independence, its commitment to personal expression, and its faith in its revolutionary promise, that is today the most strikingly provocative," noted Edward Abrahams, discussing the many books and exhibits that appeared in 1989 (the hundred-year anniversary of the artist's birth) in New Republic. "These are the abstract watercolors and charcoals, which, unlike most of O'Keeffe's better known art, still retain their expressive power. They are the works about which Stieglitz wrote in 1916 that '291 had never before seen woman express herself so frankly on paper.'" As her relationship with Stieglitz matured, O'Keeffe spent time with him both in New York City and at his family's summer home on Lake George in upstate New York. Even before they were married, she became the subject of many of the noted photographer's famous studies. Stieglitz shot over three hundred pictures of the serious, dark haired painter, many from his Lake George home. Working in their New York apartment, O'Keeffe used oils to depict the skyscrapers, clouds, and buildings that shaped the city skyline, and from their summer home she painted country vistas, gathering the shells, rocks, and flowers that later became characteristic themes in her work. Some of the more notable paintings of this period include Lake George by Moonlight, done in 1924, and The Shelton with Sunspots, a rendering of the Lexington Avenue apartment building where she and Stieglitz lived, worked in oils in 1926. After the 1920s O'Keeffe's work became increasingly objective, or realistic, in nature. Gradually the impressionistic watercolors, with their feminine, almost musical quality, and the unconventional cityscapes were replaced by more clearly drawn objects. O'Keeffe especially became noted for her oversized flower paintings, which display her talent for amplifying the inner design and purpose of ordinary objects. Producing the first of her flower paintings as early as 1919, the artist arranged greatly enlarged and vibrantly colored stylized flower blossoms decoratively on the picture plane. She often did several versions of the same subject, experimenting with changes in light, position, and color. Notable among these works are Oriental Poppies, completed in 1928, and her famous Jack-in-the-Pulpit series, done during 1930. According to Calvin Tompkins in the New Yorker, "to many people, the swelling forms and mysterious dark voids [of the flowers] bore unmistakably sexual overtones, and any number of critics in discussing them made heavy use of Freud." In her typical response to any sort of critical interpretation of her work, O'Keeffe vehemently rejected such inferences to sexuality, simply stating that she painted the flower image large so that people would "be surprised into taking time to look at it" and see, as the artist did, its wonderful color, shape, and texture. In the same way, the shells, rocks, and landscapes she also painted express, as she wrote in her autobiography, "what is to me the wideness and wonder of the world as I live it." While some critics took issue with O'Keeffe's later work for its stylized, posterlike quality, others applauded these more "objective" works. "Her [flower] work is charged with the mysterious," Ralph Pomeroy later remarked in Contemporary Artists. "In her hands, flowers, looked at so closely and presented so out of natural scale, become worlds threatening to engulf us in sensual floods of shape and color as though we are bees about to become drunk on nectar." By the end of the twenties O'Keeffe began to feel that her creativity was beginning to end; she decided to take a summer trip to Taos, New Mexico, at the invitation of good friends Rebecca Strand and Mabel Dodge Luhan. Although she had visited the area before and had been impressed by the southwest's dramatic diversity ever since teaching in Texas, it was during this trip in 1929 that O'Keeffe was first awakened to the austere beauty of the southwestern landscape and inspired to make it part of her creative work. While she travelled extensively around the United States, Mexico, and the rest of the world for the next three decades, the sunlight, sun-dried adobe walls, and desert plants common to the dry, arid Southwest climate continued to be a magnet for her artistry. In the mid-1930s O'Keeffe established a second home in Taos, away from both New York City and Stieglitz, with whom she had become semi-estranged over the years due to the marital infidelities of both. While occasionally returning to the East Coast to visit her husband, O'Keeffe's hours spent hiking through the areas mountain and desert terrain were among her most joyous. As this joy was transferred onto the canvas, more and more people became saw the beauty of the desert through O'Keeffe's eyes. Eventually such notable nature artists as photographers Eliot Porter and Ansel Adams came to New Mexico to travel the desertscape alongside O'Keeffe. On one hike near Taos, taken after the area had experienced a prolonged drought, O'Keeffe was unable to find the flowers that were her usual subjects. Instead, her eyes were drawn to the brilliant, sun-bleached bones that lay scattered among the cacti and low-lying brush. In the bleached desert bones of animals, where critics saw death and allusions to crucifixion, O'Keeffe saw beauty: "The bones," she later explained in her autobiography, "seem to cut sharply to the center of something that is keenly alive on the desert even tho' it is vast and empty and untouchable-- and knows no kindness with all its beauty." One of her most famous paintings of this period, Cow's Skull: Red, White, and Blue, painted in 1931, incorporated these bones. In the composition, the deathly white skull of a bull is positioned starkly on a rectangle of blue over a gray-white background; framed by a band of red running down both side edges, O'Keeffe's painting combines truly American elements. After Stieglitz died in 1946 at the age of eighty-two, O'Keeffe returned to live in the Southwest. She made her permanent home in Abiquiu, New Mexico, in 1949. From there she often travelled to visit Ghost Ranch, a remote vacation resort located several miles northwest of Espanola, New Mexico. The earthen colors--ocher, tan, and red--reflected from the New Mexico landscape to the huge canvasses she painted, both in Abiquiu and at Ghost Ranch. The simplicity of the region's landscape and its vast scale--with huge cliffs and large expanses of space--were also reflected in her work, which often utilized simple geometric shapes and large contrasts between light and shadow. Always based on something seen in the landscape, O'Keeffe's paintings (and watercolors, used in those instances when "I never had the time for oils") render form in an austere manner, eliminating details, reducing subjects to their essential components, strongly modelled and luminously colored. "She turns sun-bleached skulls into icons for some unknown cult," Pomeroy comments on works of this period, which include Blue River, from 1935, and Pelvis with Moon, painted in 1943. "Hills heave and spread like bodies, high-altitude clouds could be ice floes in a thin blue sea. The architecture of the adobe is shown so pure in line as to vie with Mies or Mondrian." Hilton Kramer discusses O'Keeffe's work in the New York Times Book Review by noting that, "Like a good deal of American painting, O'Keeffe's take an essentially romantic view.... In contrast to earlier romantic styles, however, her own impulse has been to simplify and essentialize the forms ... to reduce them to a few spare elements of color and light organized within a firm structure of drawing, and then to amplify what remains with a sort of ascetic grandeur.... The result is an art at once sensuous and detached--an art of organic forms and earthly light transformed into cool structures of exquisite color in which we may still discern the shape and texture and atmosphere of the observable world." From 1947 to 1949 O'Keeffe occasionally left her home in Taos to work on retrospective exhibitions from the Stieglitz estate for display in Manhattan's Museum of Modern Art; she also directed artistic installations of her late husband's life work for the Art Institute of Chicago. Although afraid of flying at first, the elderly artist gradually became fascinated by the view above the clouds and painted several pictures, such as the Sky above Clouds series, painted between 1963 and 1965. These pictures seemed, at first glance, to be abstract paintings, until the viewer suddenly sees the outlines of meandering riverbeds, the geometric patterning of cultivated farmland, and the traceries of roadways, all of which serve as a backdrop for drifting clouds. As the years went by, O'Keeffe grew confident enough of the advances in air travel to attempt a world tour, which took her to Peru, Greece, and Paris among other places. Juan Hamilton, a young potter, entered O'Keeffe's life in 1973. Out of work and looking for a job, he started as a handyman of sorts; he remained by the otherwise reclusive artist's side until her death years later, kindling in her an interest in sculpture which grew after her eyesight failed and she could no longer paint. While some biographers have hinted that a love relationship developed between the elderly painter and the young potter (he would inherit the bulk of her estate--as well as twenty-four of her paintings--which the I.R.S. valued at over $70 million), it was Hamilton who encouraged O'Keeffe to write her autobiography, Georgia O'Keeffe (1976), which was illustrated with photographs of her paintings. The artist was also prompted to set forth the facts of her life because she was tired of the misinformed interpretations critics were making about her paintings. "No one else can know how my paintings happen," she said in the book's opening passage. Eschewing the usual biographical data, the autobiography is a personal commentary on O'Keeffe's work, revealing her artistic rather than personal life. "Where I was born and where and how I lived is unimportant," she explains in the book's introduction. "It is what I have done with where I have been that should be of interest." Georgia O'Keeffe, which sold over 300,000 copies, was praised by many reviewers, not only for its fascinating manner of revealing one artist's way of seeing the world, but because of its illustrations. A Washington Post Book World critic found Georgia O'Keeffe "a wonderful book that is really worth what it costs, not only for the beautiful reproductions of Georgia O'Keeffe's paintings, but for the remarkable text she has written to explain herself as an artist; how many of these paintings came to be, and what they mean to her." "It's rare to have such commentary from an artist," he added, "but the lucidity, the exactness, the spare eloquence, the fine honesty of the writer give it the quality of a classic." Kramer, too, hailed Georgia O'Keeffe as a "beautiful book" describing a career "that embraces not one or another phase of [the] history [of U.S. modern art], but virtually the whole of it." "Naturally, we are eager to have more than she has given us," Kramer added, "but what she has given us is extraordinary.... Both the writing and the plates have the effect of renewing our appreciation of a very remarkable artist." Interest in O'Keeffe's life and work rose sharply during the 1970s, a result not only of the publication of her autobiography but also of the women's movement then underway. Feminists hailed her as an icon-- independent, self-sufficient, successful in a male-dominated culture; responding to the changing mood of a nation, President Gerald Ford awarded O'Keeffe the Medal of Freedom in 1977. O'Keeffe, it should be remembered, had adamantly resisted any attempts to label her a "woman artist"--in fact, she prohibited the publisher of the 1976 work entitled Women Artists: 1550- 1950 from reproducing any of her flower pictures in their volume. It is ironic, therefore, that it was as a woman artist that she was ultimately revered. In the decades since this reflowering of interest in her work occurred, O'Keeffe's canvasses have been eagerly hunted by collectors willing to pay a high price for an original painting; her flower paintings, in particular, have found their way to stationary, calendars, wall graphics, and other consumer goods; her image as a wrinkled, self- sufficient, lone woman standing amid the sunbaked landscape of New Mexico prefaces almost all accounts of her life and work, from biographies to museum catalogues of her paintings. In 1983 O'Keeffe was honored by President Ronald Reagan as the first recipient of the National Medal of the Arts. While some critics have suggested that the artist's public persona was as carefully crafted by O'Keeffe as her paintings in an effort to continue her fame as an artist even into old age, with her death in 1986, she became part of the mythos of the twentieth century. O'Keeffe died in Santa Fe; her ashes were scattered over the sunbaked hills of her beloved New Mexico. December 18, 2003: O'Keeffe's painting Special 21 (Palo Duro Canyon) was stolen from Santa Fe's Museum of Fine Arts in New Mexico. The painting is worth $500,000. January 9, 2004: A guard at the Georgia O'Keeffe Museum in New Mexico was charged with embezzlement and criminal damages to property after reporting that O'Keeffe's 1919 painting Red Canna had been stolen. Authorities quickly recovered the painting after determining that the guard had taken the canvas. Chase Still Life Award, 1907-08; medal from American Academy of Arts and Letters, 1962; creative arts award, Brandeis University, 1963; Wisconsin Governor's Award for Creativity in the Arts, 1966; distinguished service citation in the arts, Wisconsin Academy of Sciences, Arts and Letters, 1969; Benjamin Franklin fellow, Royal Society for the Encouragement of Arts Manufactures and Commerce (London), 1969; gold medal, National Institute of Arts and Letters, 1970; M. Cary Thomas Prize, Bryn Mawr College, 1971; National Association of Schools of Art citation, 1971, for contributions to the visual arts; Edward MacDowell Medal, MacDowell Colony, 1972; gold medal, Skowhagen School of Painting and Sculpture, 1973; first annual New Mexico Governor's Award, 1974; Presidential Medal of Freedom, 1977; National Medal of Arts, 1985; honorary degrees from universities, including College of William and Mary, 1938, University of Wisconsin, 1942, Mount Holyoke College, 1952, University of New Mexico, 1964, School of Art Institute of Chicago, 1967, Brown University and Columbia University, both 1971, Minneapolis College of Art and Design, 1972, Harvard University, 1973, and College of Santa Fe, 1977. Artist. Worked as a freelance commercial artist in Chicago, including illustrator for advertising firms, 1908-10; Amarillo, TX, public schools, art instructor, 1912-13; West Texas State Normal College (now West Texas State University), Canyon, head of art department, 1916-18; full-time artist, 1918--. Instructor in art at University of Virginia, 1913-16, and Columbia College, Columbia, SC, 1915-16. Exhibitions: Works exhibited internationally and represented in permanent collections, including Metropolitan Museum of Art, Museum of Modern Art, Whitney Museum of American Art, and Art Institute of Chicago. One-woman retrospectives include Art Institute of Chicago, 1943, Museum of Modern Art, 1946, Worcester Museum of Art, 1960, Whitney Museum of American Art, 1970, and Metropolitan Museum of Art, 1989. * The Work of Georgia O'Keeffe: A Portfolio of Twelve Paintings, introduction by James W. Lane, Knight Publishers, 1937. * Drawings, introduction by Lloyd Goodrich, Atlantis Editions (New York City), 1968. * Some Memories of Drawings, Atlantis Editions, 1974. * Georgia O'Keeffe (autobiography), Viking (New York City), 1976. * (Author of introduction) Alfred Stieglitz, Georgia O'Keeffe: A Portrait by Alfred Stieglitz, Viking, 1978. * Georgia O'Keeffe: One Hundred Flowers, edited by Nicholas Callaway, Knopf (New York City), 1987. * Lovingly, Georgia: The Complete Correspondence of Georgia O'Keeffe and Anita Pollitzer, edited by Clive Giboire, Simon & Schuster (New York City), 1990. * Georgia O'Keeffe: Paintings, Random House (New York City), 1994. * O'Keeffe's work has been represented in numerous exhibition catalogues. Collections of O'Keeffe's letters are housed at Yale University, New Haven, CT (closed to the public until 2011). * Adaptations: A television documentary of O'Keeffe's life was directed by Perry Miller Adato, PBS, 1977. O'Keeffe has been the subject of numerous educational films and several motion pictures. View the full website biography of Georgia O'Keefe.